Many of us travel to Thailand because we love Thai food. Some people travel for different reasons, particularly the beautiful beaches in Southern Thailand. On some streets, you wonder what country you are in. One of the most beautiful regions of Thailand is the province of Krabi, particularly along the coast. It is filled with the beauty of lush greenery and limestone karsts. In the early years, Kasma would take her trips to stay at Ao Nang Bay. At the start there was only one place to stay on the entire bay; gradually, as people discovered the area, it became more and more built up until, now, it resembles some of the more crowded areas of Phuket. This last year we visited Ao Nang again to catch a longtail boat out to do some snorkeling. I had to take a picture of the stretch of street pictured to the left. One right after another you see: 1) La Luna, an Italian restaurant with “Italian Management;” 2) Royal Tandoor Indian Food, serving “Indian food” & “Royal Thai Food,” and; 3) Beccofino – “Ristorante Italiano & Thai Cuisine.” If you click on the picture to the above left , you’ll see a larger version that reveals the signs more completely. Actually, I learned something from the sign at Royal Tandoor Indian Food. 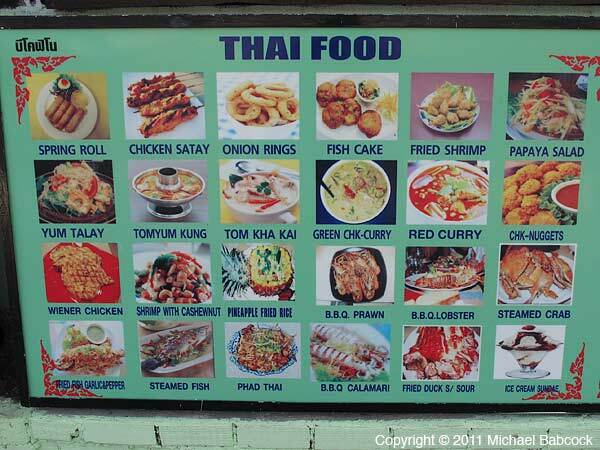 They display a selection of their Royal Thai Food in the picture to the right. 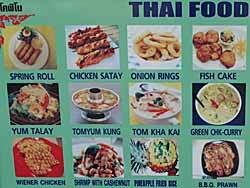 I had never known before that “Wiener Chicken” was a Thai dish. It’s in the lower left corner: click on the picture to see a larger version and also to see (to the right) “CHK-NUGGETS” (presumably “Chicken Nuggets”). Kasma has never prepared either of these dishes. I’d be a bit surprised if they appear very often on the menu at the Royal Palace. I have my doubts about the onion rings as well. Of course, these restaurants reflect the economic law of supply and demand: if there weren’t enough people visiting the area who wanted to eat Italian food or Pizza and Indian food, they would not exist. Along Ao Nang most of the people you see are fahrang – Caucasian. I suspect that the vast majority are Europeans. 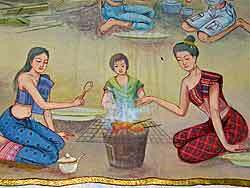 Apparently, after awhile they long to eat the cuisine of their home rather than yet another Thai meal. A few doors down from these three restaurants is a Sushi Bar and Grill. 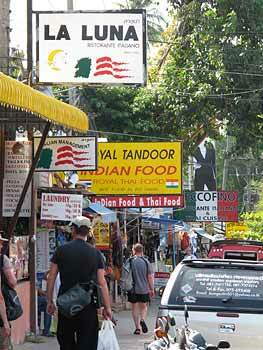 For much of the street it’s hard to find a restaurant that serves only Thai food. And dishes such as Wiener Chicken and CHK-NUGGETS have sprung up to fulfill a need. Apparently someone orders them. I think part of it may be the Thai restaurant owners desire to please their customers: in fact, this friendly impulse can sometimes short-circuit a well-meaning fahrang’s attempt to get authentic Thai food. 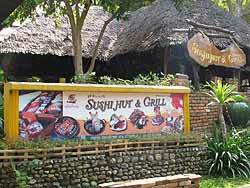 In many instances when a restaurant has served authentic, full-flavored Thai food, their fahrang customers were unable to eat it. So often, and probably more often in the tourist areas such as this one, they try to make food the way they think fahrangs want it. I think of it as dumbed-down Thai food. This modified-for-fahrang-food is one reason that some people come back thinking street food is the best Thai food in Thailand: street vendors are less likely to dumb the food down. 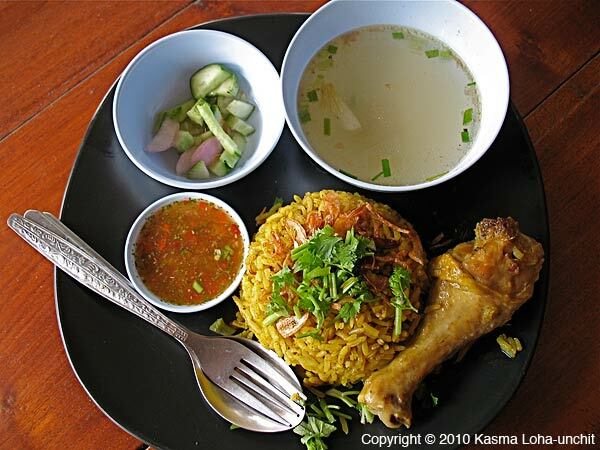 Kasma’s opinion, and I agree with her, is that the very best Thai food is generally found in restaurants, if you know where to go and how to order. 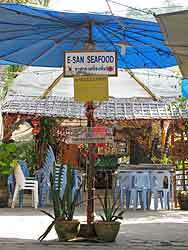 One of our favorites is Ruen Mai in the town of Krabi, 25 kilometers or so from Ao Nang Bay. 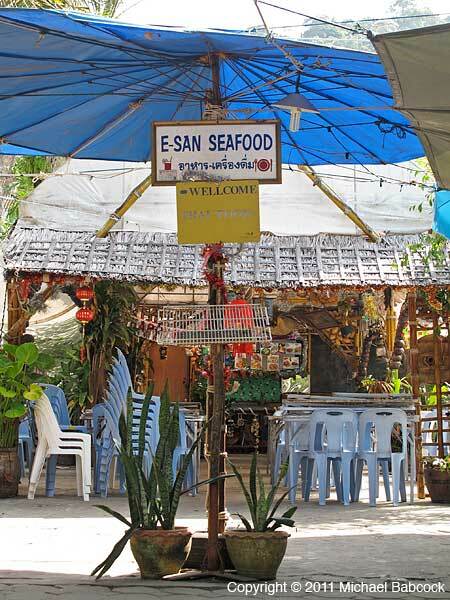 As we continued walking down the street, we finally came to a restaurant we might consider, one with the sign “E-san Seafood.” “E-san” is an alternate spelling of Isan (or Isaan, or Isahn), the region of Northeastern Thailand. Although NE Thailand is land-locked, it is bound by the Mekong river along much of its boundary, so “seafood” is still an integral part of the food there. 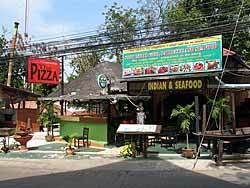 Since Isan food is generally spicy and tasty, this place might be worth a try. 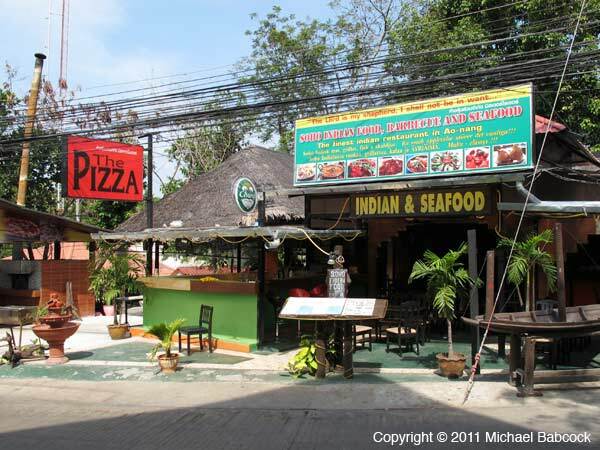 Of course, as we turned the corner what do we see but a pizza restaurant next to another Indian restaurant. Jasmine rice is Thailand’s top export rice. In fact, most of the jasmine rice the country grows is exported to foreign markets far and wide. Has Thailand always grown jasmine rice? When and how did it come about? To answer these questions, a little bit of history would be helpful. Agricultural policies from as early as the ancient Sukhothai period of Thai history through the centuries of bustling international trade of the Ayuthaya period and into the modern era have actively encouraged the people to develop land into rice fields, for the nation’s food and income security and as a strategy to extend and maintain ruling power. 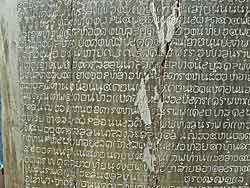 If you travel to the Chiang Mai area, you’ll see impressive remains and hear lots of mention of the old and glorious kingdom of Lanna (“a million rice fields”); and in the Sukhothai area where the first Thai kingdom was established more than seven centuries ago, you’ll hear accounts of the first example of the written Thai language in its best-known passage alluding to a prosperous kingdom where “in the water there is fish, in the fields there is rice…” ruled by a benevolent king. There’s evidence that irrigation canals (klongs) were already in place at the birth of the country in the 13th century. Today, irrigation still remains a crucial service the state provides to its people to grow rice. In the early part of the Rattanakosin modern era (late 18th, early 19th centuries), as much as 95 percent of farmland was allocated for growing rice and Siam prospered from exporting rice to China. Rice farming continues to be the primary farming activity nationwide and the Thai word for farmer, chaona, lterally means “rice field person”. 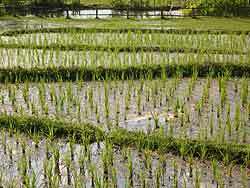 Rice farming in cultivated fields has been done on the land that is now Thailand for at least five thousand years, one thousand years earlier than in India and China. Archaeologists have found traces of rice husks and chaff in the pottery excavated from ancient burial sites in northeastern Thailand that date back at least 5,400 years. At another site in the northwest, a thin stone tool in the shape of a knife for harvesting rice and pottery containing rice husks, dating back at least 5,000 years, have also been found. 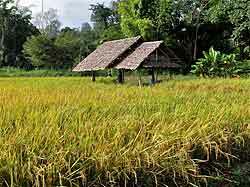 From the archaeological evidence, some researchers believe that the Asian rice species might very well have originated in the inland valleys of the northern parts of Thailand, the Shan state of present-day Myanmar and adjacent areas of Laos where the annual monsoons, warm humid climate and fertile lowlands offered an ideal environment for its domestication. 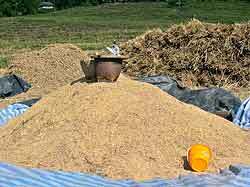 In ancient times, it is likely that nomadic tribes began settling down to cultivate rice by selectively gathering wild rice from the forests and from swamplands to grow and gradually improving the rice strains by selective breeding. Around the turn of the 20th century, Thai rice was exported to Europe through rice traders in India. It didn’t sell as well as Indian rice since the latter had beautiful, uniform long grains while Thai rice was irregular in quality with much of the grains broken. King Rama V, in his extensive travels to many parts of Europe around that time, made an important observation. His Majesty noted that the irregularities in Thai rice most likely came about because Thai farmers planted too many varieties and there was no attempt to standardize and select strains with superior qualities to grow for export. To encourage the identification of superior strains that the country could promote to improve the quality of Thai rice exports, His Majesty inaugurated the first indigenous rice contest in 1907. In the ensuing years, several indigenous varieties with fine attributes were discovered, tested in field trials, then promoted by the government to farmers to grow for foreign markets. One of the strains was Pin Kaew, submitted by a woman from Sriracha in Chonburi province, which went on to win the coveted first prize at the World Rice Contest in Canada in 1933. It became Thailand’s top rice for many years. But it wasn’t until the early 1950’s when a truly earnest campaign was carried out to collect native rice strains nationwide in search of other high-quality varieties to promote and export. Some 6000 samples were collected between 1950 and 1952. Promising samples from the Panat Nikom district of Chonburi province were planted alongside other selected strains from the north, northeast and central regions in field trials to compare quality. Of the 199 samples planted at the rice research station, several superior strains were discovered, among them jasmine rice 105 (dok maii 105, later known as hom mali 105), the number corresponding to the row the rice was planted in the trials. In 1959, a selection committee conferred on jasmine rice 105 the highest recommendation because of its pure white, long slender grains and sweet pandanus leaf fragrance (not jasmine fragrance as misled by its name, see Part 1). First cultivated by a farmer in Chonburi province in the 1940’s, jasmine rice 105 has since become an important breeding strain for other rices throughout Thailand. Jasmine rice is most commonly grown as an in-season rice watered by the monsoon rains, since it is a light-sensitive variety of rice. While there are varieties that would flower and set seed any time of year, light-sensitive strains will flower and set seed only when the length of the day is shorter than the length of the night. 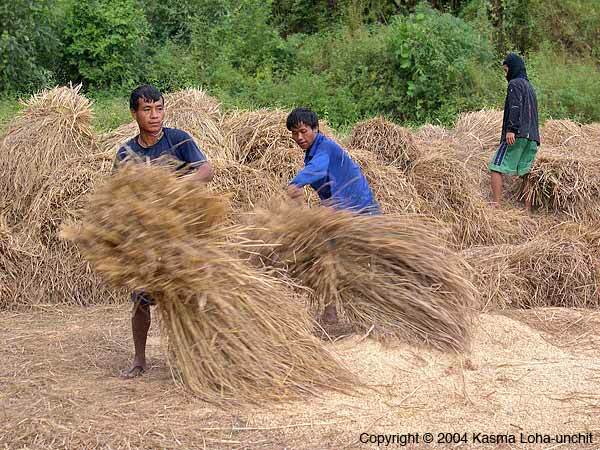 Farmers, therefore, prefer to plant such rice during the main monsoon season (July to October). Jasmine rice stalks begin to flower by October when the days are shorter than the nights. To many discerning Thais, in-season rice tastes better than off-season rice grown with irrigation water. Today, with continued government support and stringent quality control standards, all rice destined for export must pass the government stamp of approval before it can be shipped. The active involvement of the government in the promotion of Thai rice abroad has placed jasmine rice in the spotlight on the world stage. Among discerning Asians in many countries, jasmine rice is considered the best-tasting rice in the world. As mentioned in Part 1, the Chinese, for instance, are so fond of the jasmine rice grown in northeastern Thailand, especially the provinces of Surin, Yasothon and Roi Et, that they would like to have a monopoly on all the rice grown here. The jasmine rice from these provinces is particularly fragrant and has a better texture than jasmine rice grown in other areas. I, too, prefer the jasmine rice grown in the northeast, and recommend it to my cooking students by advising them to buy the Golden Phoenix label, which consistently markets top-grade jasmine rice from this region and has won the Prime Minister’s Export Award. 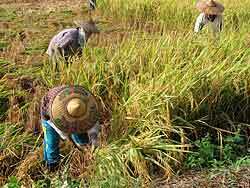 Besides where the rice is grown, the fragrance, texture and flavor can differ depending on the age of the rice. Jasmine rice is softest and most fragrant when newly harvested. As it ages, it gradually loses fragrance and becomes firmer and dryer, requiring more water to cook (see Steamed Jasmine Rice). If the bag of jasmine rice you buy in a supermarket here in the States seems to take a lot more water to cook than usual, has a hard texture and doesn’t seem to have any fragrance at all, then it’s likely that the rice is old and may have been sitting around in warehouses for a long while. For this reason, it’s worthwhile to make it a habit to check the date of harvest, if there’s any, shown on the bag (with many brands, it’s more likely to be the date of shipping, or date of expiration, which isn’t as good an indicator of the rice’s age). 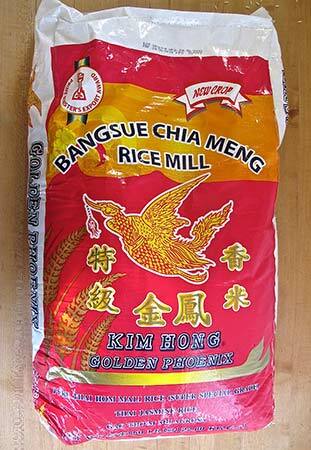 On larger bags of rice from ten pounds up, the label may include “New Crop” on the top, but make sure this is followed by the current year (i.e., “New Crop 2011”). 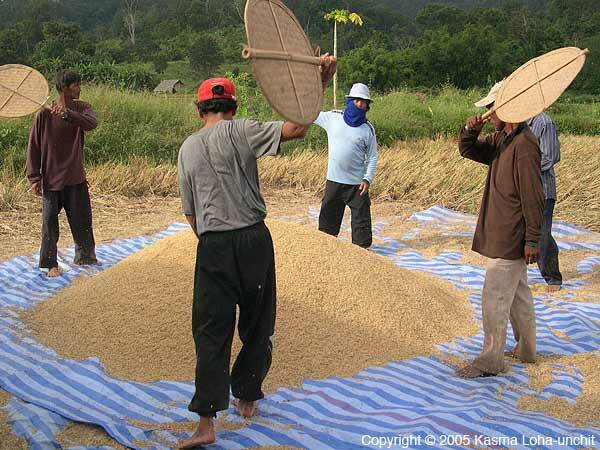 The primary rice harvest season is between October and December in main rice-growing regions in Thailand and new rice is shipped out starting in November. With Golden Phoenix being a reputable premium label and a favorite among Asians, there’s usually a high turnover in busy Asian markets, so you most likely will get new rice or rice not older than a year. For high quality rice, such as Golden Phoenix’s, even a year-old to two-year-old jasmine rice stored under proper conditions can still retain good fragrance and a texture that’s deliciously firm and chewy – perfect for making flavored rice dishes such as the Muslim yellow rice (kao moek gkai) and the popular chicken fat-flavored rice (kao man gkai). If texture is more important to you than fragrance and you like your rice al dente firm and chewy, then an aged rice of one to two years may suit you better than the new rice Asians prefer. For a good mix of firm texture and delectable fragrance, about a six- to ten-month old rice would be ideal – i.e., a bag labelled “New Crop 2011” would be at this stage from July on. While China by its sheer size is the world’s largest producer of rice, Thailand has led the world as the largest rice exporter since the 1960’s, owing much of this status to jasmine rice. Even with a population of 67 million, each consuming an average of nearly a pound of rice a day (in various forms besides steamed rice, including rice noodles, desserts, crackers, snack foods, rice liquors, vinegar, etc. ), half of the rice Thailand grows is exported. Jasmine rice makes up half of the country’s rice exports with China being the biggest buyer of this deliciously fragrant rice, though Europe and the United States take a big share as well. Rice is an intrinsic and inseparable part of Thai culture and there is no other food crop that receives blessings in every stage of its life cycle in rituals that parallel the life cycle of human beings. From annual royal rituals dating back seven hundred years (i.e., the Royal Ploughing ceremony, the Rain-Pleading ceremony, the merit-making ceremony to honor the Mother Spirit of Rice) to age-old folk rituals still performed before cultivation, at the time of planting, during the period of maturation and at the time of harvest, different spirits are asked to protect and nurture the rice crop. Rice is always present in one form or another as ceremonial foods in religious and important civil celebrations and at cultural festivals in all regions of the country. 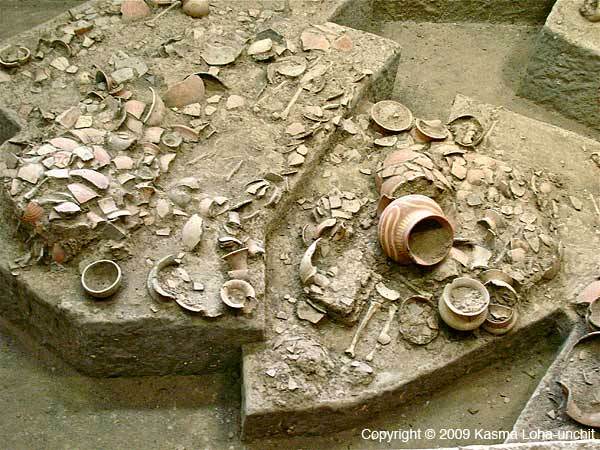 These foods often appear in the murals of local temples. 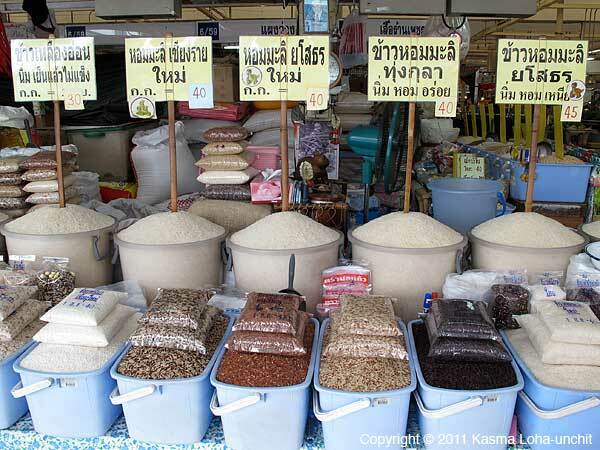 Rice is so much a part of Thai identity that it is frequently used as metaphors in figures of speech. 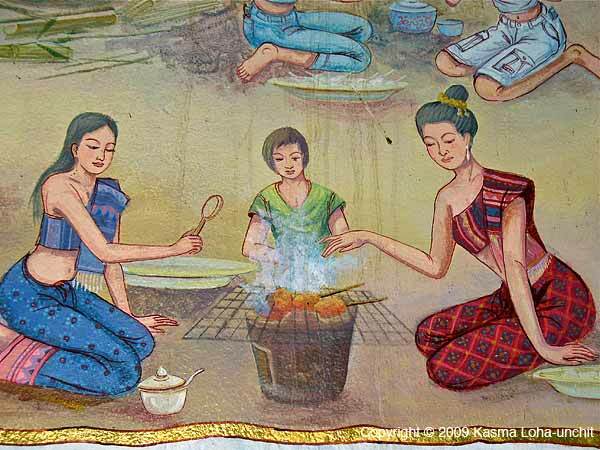 Not a day passes in the life of a Thai in which rice does not play a role. A new movement in rice consumption is picking up steam in Thailand: the return to heirloom, location-specific whole-grain rices and GABA or germinated rice. I hope to write about this new trend sometime in the near future. Did you know that rice feeds one in three people in the world and 90 percent of the world’s rice is produced and consumed in Asia? 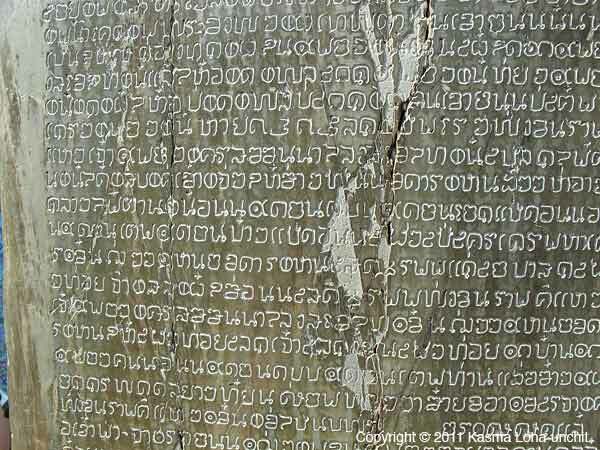 Much of the information contained in my two blogs on jasmine rice was gleaned from two books published in the Thai language — Kae Roi Samrap Thai and Kao – Wattanatham Haeng Chiwit — and a few articles from Thai newspapers. Written by Kasma Loha-unchit, April 2011. Thai Jasmine Rice – Hom Mali – Thailand’s best-known rice, is something increasing numbers of people are becoming familiar with and have come to love eating, as the popularity of Thai food continues to soar worldwide. In fact, it has become so widely distributed and so synonymous with Thai cuisine abroad that some people have developed a misconception that jasmine rice is the only rice most Thais eat on a daily basis. This is not so as Thailand grows and consumes many other good-eating varieties and some regions of the country actually prefer other kinds of rice to jasmine rice. I read in a book on Thai food history that Thailand has some 3,500 varieties of rice within her borders, both wild and cultivated. Wow! that’s astounding! But wait till you hear this: The same passage reveals that there are as many as 120,000 varieties, both wild and cultivated, worldwide! Now, that’s unfathomable to the average citizen of Middle America who may know rice only in the form of Uncle Ben’s converted or that highly processed stuff called “Minute Rice”. Vastly different topography, weather patterns, soil conditions, and consumption preferences combine to determine the varieties grown in each of Thailand’s many regions. For instance, in the mountainous north, the monsoon rains come early and end quickly, so varieties that grow and ripen fast are cultivated. Northerners prefer to eat sticky rice, so little jasmine rice is grown for local consumption. 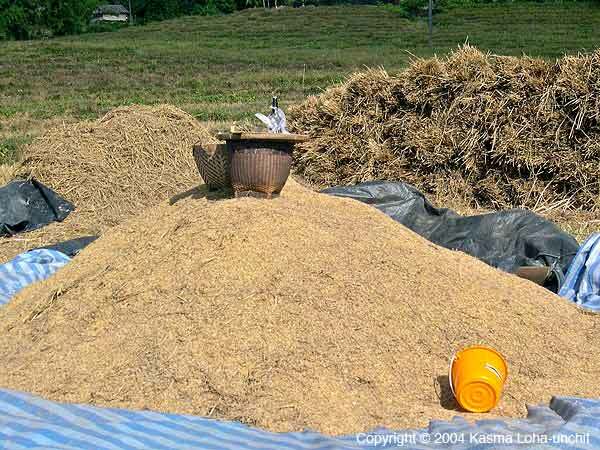 On the other hand, growing conditions in the northeastern region are ideal for jasmine rice and lots of it is grown there, but like northerners, people in the northeast prefer sticky rice, so little of the jasmine rice they grow is consumed there. Most of it is trucked off to Bangkok for shipping to foreign markets, where it fetches a good price to earn the country a good chunk of foreign exchange each year. In each of the regions, there are varieties indigenous only to small pockets and these are strains that native peoples of the area are likely to grow for their own consumption. 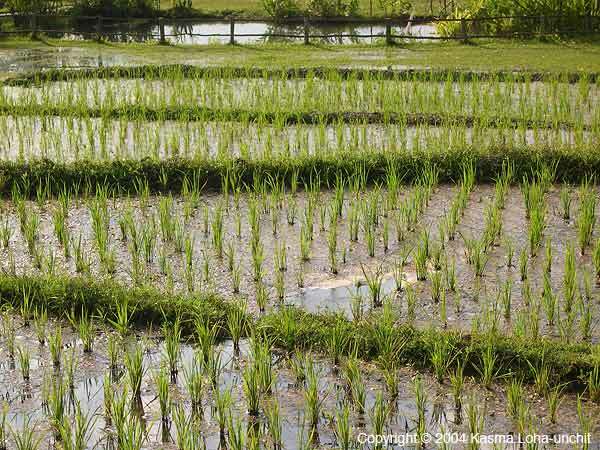 Indigenous rices are easier to grow and are pest-free as they have selectively adapted to the conditions in particular areas – perhaps over centuries or, possibly, even millennia. They are also usually higher in nutrients than introduced hybrids. Even with jasmine rice, there are varying strains developed for cultivating in different areas to match local growing conditions, ensuring a bountiful harvest of the best rice each locale can grow. This may explain why the jasmine rice you buy in your local market in America can differ considerably from label to label – in fragrance, texture and flavor. 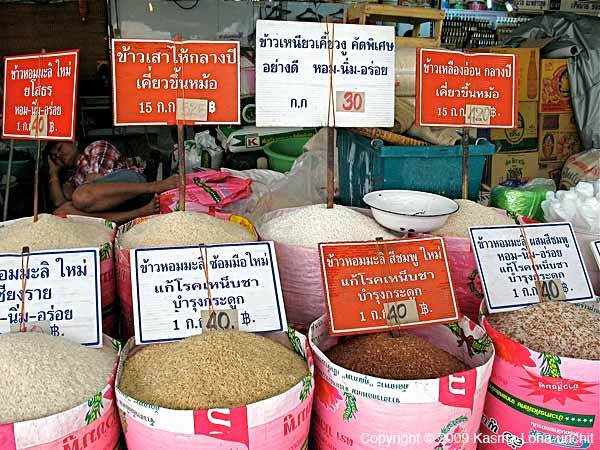 The Chinese, who are very fond of jasmine rice, know this and can be very selective when buying rice from Thailand. For instance, Hong Kong would only buy the jasmine rice grown in northeastern Thailand, particularly in the provinces of Roi Et, Yasothon and Surin. The jasmine rice from this area is much more fragrant and softer in texture than jasmine rice from other parts of of the country. As for the jasmine rice grown in the much more temperate climates of Florida and Texas, you might as well forget it – it simply is no longer jasmine rice. 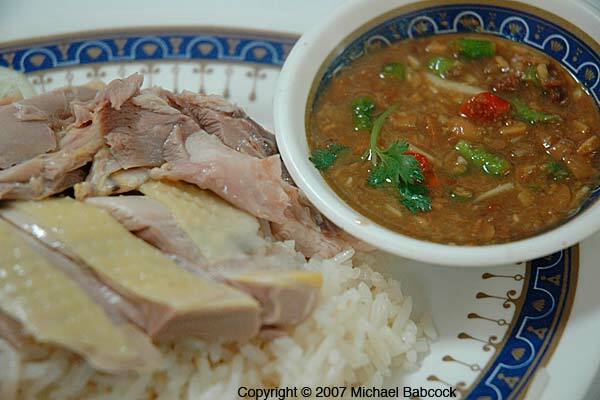 (See Kasma’s article Thai Jasmine Rice – Kao Hom Mali for her experience with Texas Jasmine Rice). Thailand holds the patent for jasmine rice, so it’s unlikely anyway that the rice grown in these two states can claim to be true hom mali jasmine rice. Last year a food agent wanted me to try out a “super-premium jasmine” rice imported from Vietnam in hopes that I would recommend it on my website. He sent me a 25-pound sack. I cooked it once and that was quite enough! The rest went out the door with my Vietnamese kitchen helper who was very happy since this was the rice she’s used to eating. By no stretch of the imagination is it jasmine rice and I find it very misleading for an inferior rice with absolutely no fragrance, a hard texture and a greyish tint to be called jasmine rice, or super-premium for that matter. People who are into food know that the same variety of red delicious apple grown in the Sierra foothills will taste different from the fruit grown in their own backyard in the Bay Area. The soil here is different and the climate is different, so it should not be surprising that the fruits don’t taste quite the same. Those of us who love good food know from experience that such and such a place grows the best this and that and, if we have a choice, we would buy a particular food from the place where it grows best. Take farmer’s markets, for instance. Why does the produce from some farms taste much better than the same produce from other farms? Is it the soil? micro-climates? cultural practices? Bing cherries are not just bing cherries, concord grapes are not just concord grapes, Santa Rosa plums are not just Santa Rosa plums, and so on. The same is true with rice, which being pretty much like grasses might have even the greater ability to morph into something completely different when conditions are far from ideal. Jasmine rice is, therefore, not just jasmine rice: where it is grown is very important. The Chinese know this and Thais know this, but many Americans have yet to understand the difference. Buying rice in fresh, open-air marketplaces in Thailand is a much different experience than buying rice in American supermarkets. 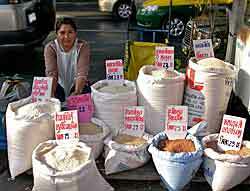 Vendor stalls usually carry a large assortment of Thai-grown rice and sell them bulk from big opened sacks, baskets, buckets or tubs. You can touch, feel, see and smell the grains without a plastic covering or paper box being in the way before you make your decision which to buy. Signs identify each rice by the variety name, but usually also tell you where it is grown, whether it is new or old rice and, sometimes, how the rice cooks up (i.e., soft, not hard when cold, etc.). For whole grain rices sold in more health-conscious markets, the health attributes of the particular grain may also appear on the sign. Big rice vendors often carry several kinds of jasmine rice and, if you examine closely, you can compare the quality by their appearance and aroma. 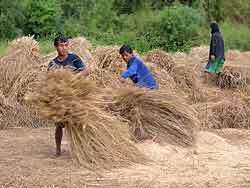 Depending on the strain, age, place of cultivation, time of maturation (i.e., rice maturing early is “light”, maturing late is “heavy”) and time of harvest (i.e., whether it is an in-season rice watered by the monsoon rains, or off-season rice grown during the dry season with irrigation water), as well as how the grains are milled for white rice, quality and price can vary. Discerning Thais claim to be able to taste the difference between rice harvested at different times of year, much like a gifted wine connoisseur can distinguish between wine vintages. Why is it Called Jasmine Rice? What is jasmine rice anyway? Its name may be misleading to unknowing westerners thinking that the rice is infused artificially with the essence of jasmine blossoms. In actuality, the rice is naturally fragrant but the aroma is not that of jasmine flowers but closer to that of “pandan” leaves (or bai toey in Thai). When the native rice was first discovered around 1950 (more in part 2, coming soon) and brought into cultivation by a farmer in Chonburi province, it was cherished because the grains, when milled, had a beautiful long shape, a shiny translucence and were white like jasmine blossoms, accompanied by a distinct sweet aroma (the rice does contain a substance also found in sweetly fragrant pandan leaves). Initially, it was given the name “white jasmine blossom rice” (kao kao malin or kao kao dok mali), but sometime later people mistakenly began calling it “fragrant jasmine” (hom mali) rice and the name somehow stuck. 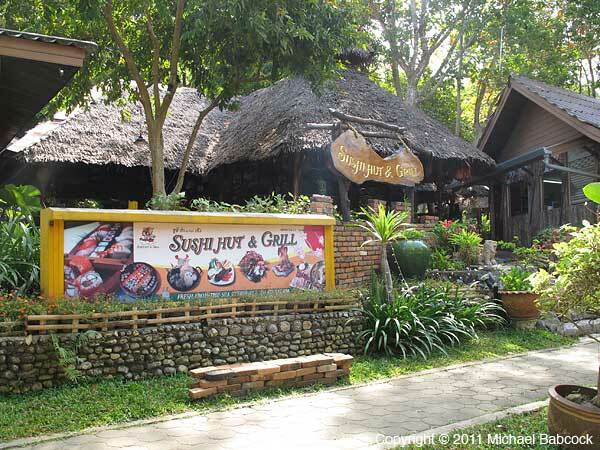 You are currently browsing the Thai Food and Travel Blog blog archives for April, 2011.